Two-Thousand-Eleven was a banner year for RasterWeb!. 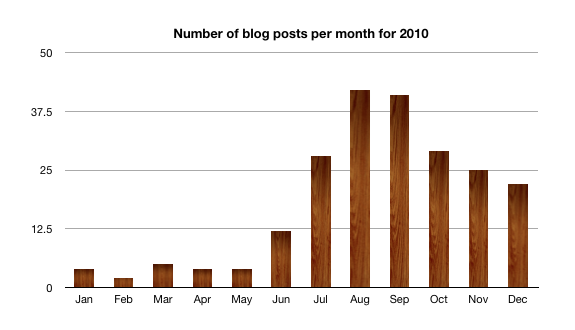 We published a total of 253 blog posts, and as you can see from the pretty chart, we were fairly consistent, with March and May being the standout months. The rise in March was due to another successful RPM Challenge which I did in February, and then released all the songs in March. May’s activity was due to me joining in for Processing Month, and posting a lot of sketches. Compared to 2010, we had 35 more posts. But you don’t care about quantity, you care about quality! Were the posts better in 2011? I don’t know, that’s for you to decide. I did however, have a few really popular posts, mostly thanks to Make Magazine, who featured a number of my posts including: Arduino-Controlled CheerLight, Zen Button, DIY Panorama Rig, Make A Sketch Draws With Processing, and the super-popular DIY Photobooth Rig with Custom Button. It’s safe to say that one of the main reasons I started blogging had to do with wanting to give something back, or as the kids say, to “share” things. When I started using the Internet in the mid-1990s, I learned a lot, and at some point I decided that I wanted to share my knowledge as well, so that’s what I did. I didn’t get into it for the money (there was none back then) but for the purpose of putting things out there that would help other people, the same way other people helped me. Sure, I publish a lot of, um, weird stuff that has nothing to do with helping people, but hey, they can’t all be winners. So with my latest adventures in making, I’ve started telling people that sharing about making is just as important as making. I believe that, and I know that Make Magazine believes that, and Instructables believes that, and Adafruit believes that. It inspires others to make things, and do things, and that’s a good thing. If I’ve inspired you, that makes me happy… and if you’ve inspired me, I thank you. Let’s keep it up! For some reason (probably the whole “end of one year, beginning of another” thing, I felt like grabbing the visitor stats for this site. I hadn’t realized that it was only about 6 months since the last time I did this. Even better, now we can compare! See the July 2010 stats if you want to review. Compared to last time, Firefox is down, while Chrome is up. I guess that’s not surprising. Chrome is gaining in popularity. 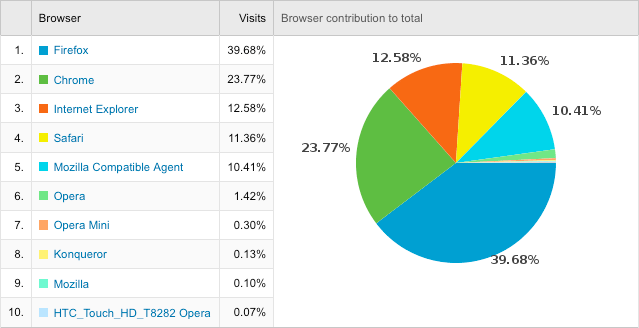 As for this site, I write about Firefox and Mozilla a lot more than I write about Chrome, so I’d still expect some good Firefox numbers. Internet Explorer is down (thank goodness!) but so is Safari. 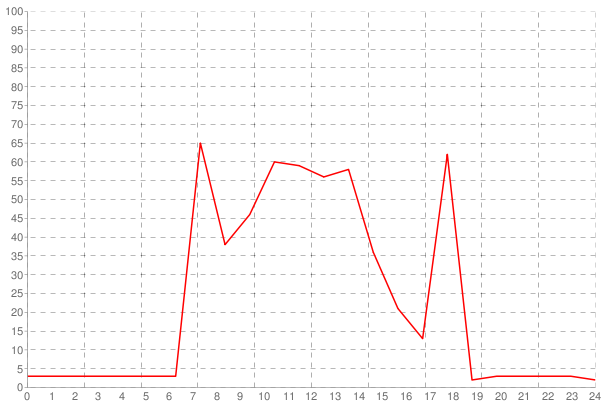 I’d almost expect Safari to go up a bit due to the iOS… but I guess not. Windows went up slightly, while the Mac stayed about the same. iPad went from less than 2% to over 11%. 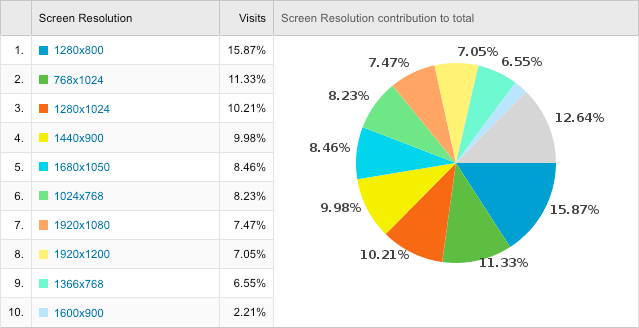 I really didn’t write much about the iPad until the end of December, of course, a lot more iPads are out there now. 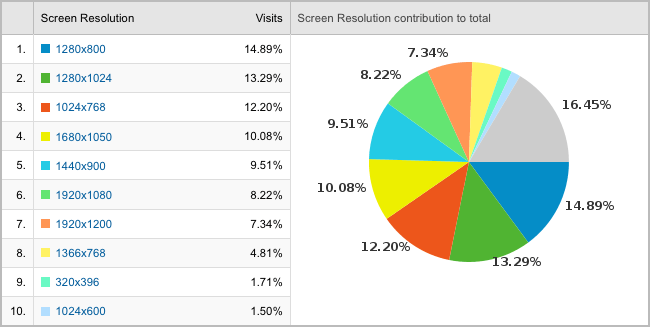 The interesting number here is the second one, 768×1024, which I believe correlates to iPad in portrait mode. Very interesting! The other numbers are all pretty close. 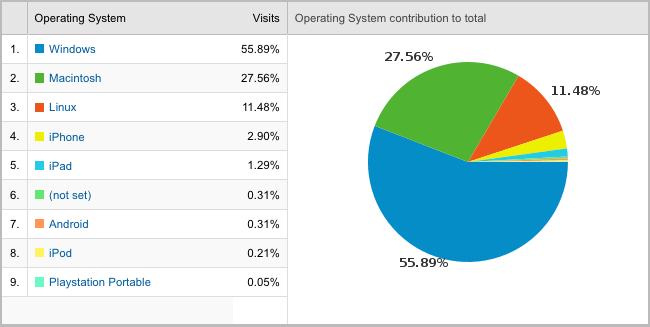 Do I really have that many visitors to this site using iPads? 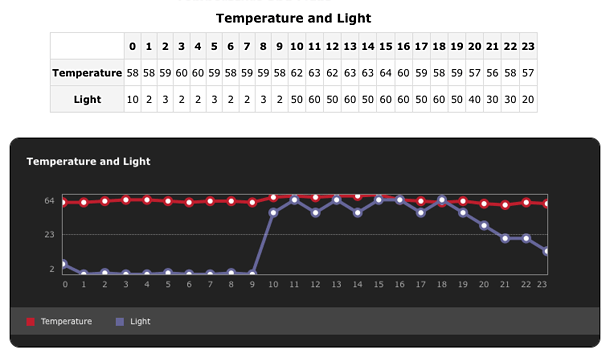 We started the year slow, having just a few blog posts at the beginning of the year. Since 1997, I’ve always managed to post at least twice per month (if not more.) I’m glad to see I haven’t gone below that number. 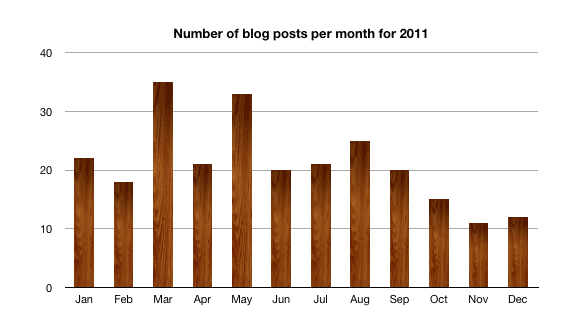 Our busiest month in 2010 was August with a whopping 42 posts! We tapered off just a bit after that, but that’s fine…we’re still seeing about 20 to 30 posts per month. It’s not just about the numbers though… I’m not consciously trying to write a zillion posts each month, it’s just (hopefully) a reflection of how many ideas I have, or how many things I have to say, or the amount I have to share with the web. So what have been a few of the more viewed posts this year? Recursive FTP using wget. I wrote this in 2007 after I had to get some files from a server. It’s a 4 line post. It gets a lot of traffic, probably because it easily and clearly provides a solution to a problem. Twitter Monkey. The Twitter Monkey post got a lot of traffic… it was posted on Make and Gizmodo, and a whole lot of other places. The video saw over 5,700 views. It’s amazing how a silly idea and a few hours of hacking got so much attention. Lanyrd. I just happened to write about Lanyrd the day it was launched. Simon Willison commented on the post, and on his own site. A few other popular posts included: vCard to CSV Converter, SCP and Spaces, Get your Gmail with Perl, and Fix Your InfoLithium Battery. I also started tagging posts this year, and it looks like I tend to post the most about barcamp. As always, visit the Archives page for a list of all the posts by month, or the Archives Legacy page for the older posts that haven’t been put into WordPress yet. Here’s to 2011 and the start of another 13 years of blogging! 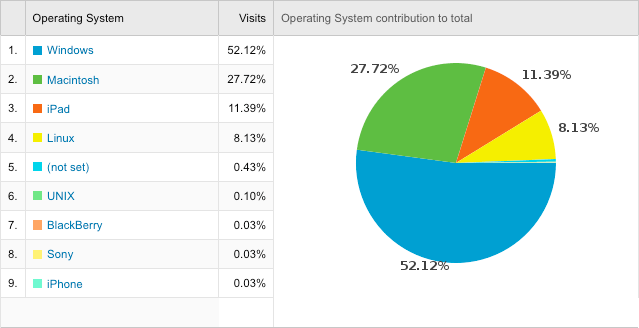 I’m typically not one to obsess over statistics related to the visitors of this web site, but I figured I’d take a look and see what the numbers might tell me. 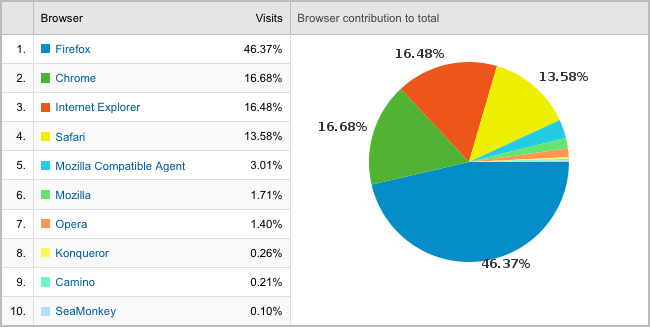 Firefox is the winner here, which wasn’t too surprising to me. I was surprised to see Chrome ahead of Safari though, even if by a small percentage. Of course I’m saddened that Internet Explorer even shows up at all. At least Chrome beat IE. Also, welcome SeaMonkey user! Too many Windows users! I’m kidding… sort of. I mean, I tend to write about things related to Macs, Linux, and open source… none of which are Windows. My assumption is that the people with corporate jobs who are forced to use Windows machines at work (but use Macs and Linux machines at home) tend to browse this site while on the job. Yeah, that makes sense. Also, welcome to both Android users, and that lone Playstation Portable user! 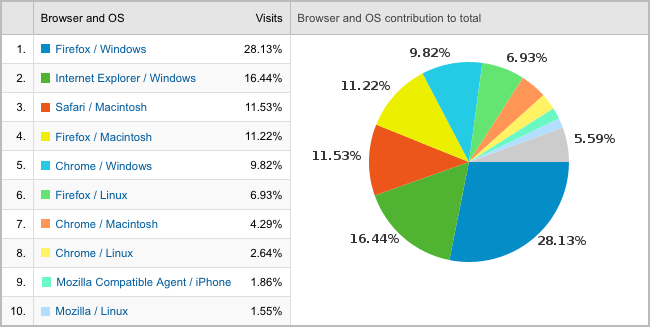 Firefox / Windows users take the lead! So at least some Windows users are smart enough to install Firefox. Not surprising, as I think it’s been at least a few years since even die-hard Microsoft fans realized that Firefox is a better/safer browsing experience than Internet Explorer. As for IE being second? Those are obviously the corporate drones who do not have privs to install Firefox. At least Safari made it into the list once… Also, welcome Mozilla Compatible Agent / iPhone (what is that exactly!?) and your friend using Mozilla / Linux! Hooray for more pixels! Is no one visiting this site on their shiny new Netbook? I spent so much time optimizing for 800×600 when I got my Eee PC.. all for naught! Those 1920×1080 screens must be all the designers I know. And that 320×396? That’d be the iPhone. So join me in welcoming all visitors to the site… be they Chrome / Windows users, or iPad users, 1024×600 screen resolution users. Welcome!